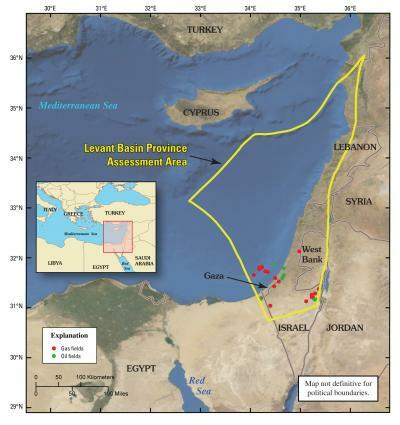 An estimated 122 trillion cubic feet of undiscovered, recoverable natural gas are in the Levant Basin Province in the eastern Mediterranean region, according to a new report. The U.S. Geological Survey estimates that the area, which includes the coastal areas near Israel, Lebanon and Syria, harbors resources that can be recovered using currently available technology. It’s the first time the USGS has assessed the area for extractable resources. Worldwide consumption and production of natural gas, which is used for electricity generation, was 110 trillion cubic feet in 2008, according to Energy Information Administration data. The USGS estimates that Russia’s West Siberian Basin also harbors considerable natural gas resources, to the tune of 643 trillion cubic feet. The agency also believes the Middle East and North Africa regions have several natural gas-rich areas, including the Rub Al Khali Basin (426 trillion cubic feet), the Greater Ghawar Uplift (227 tcf) and the Zagros Fold Belt (212 tcf). Finally, after 63 years of NO domestic energy sources (except for sunlight) whatsoever, Israel will finally have a shot at energy independence. But of course it is being challenged not only by Lebanon, which has technically been at war with Israel since 1948, but now also Turkey that has begun to push its weight around and is threatening to confront Israel on a daily basis with its large navy. In its 30 year old treaty with Egypt, Israel gave back the Sinai with its large oil resources, that Israel has developed, in exchange for increasingly worthless paper peace, or not worth the piece of paper it was written on. So this is what happens when Israel seeks peace and gives up land it captured in the many wars started by its enemy neighbors. In the old Strategic Air Command (SAC) there was a sign that read, “Peace comes from Strength.” Israel will only have peace for as long as it can remain strong. What was wrong with the sunlight? It’s only the lack of leadership which kept it useless. No use in crowing about it too much … if you do the mathematics, or figure the ‘possible demand’ VS the ‘known reserves’ and factor in the TOO MANY PEOPLE IN THE WORLD using it, we haven’t got much time until we’re all in the cold and dark anyway. Better to figure out something ‘future’ … soon. And if you think Syria is sucking the ‘juice’ out of Lebanon now … just wait ’till Lebanon develops it’s offshore resources!